How I wonder why you so shy? Fireflies have always fascinated many of us be in young or old. It’s a complete treat to the eyes to see the tiny ones glow especially when we are with our special ones. These flies can make your surroundings so romantic and beautiful. But ever imagined how you would feel if you see thousands of these flies glowing in the dark making the whole place bright. Well, I guess I would have butterflies in my tummy. It’s gonna be such a magical moment for me that I could even freeze. Would you not like to experience a night with these tiny glowing ones? Suggested Read - A new bucket list item for many, the Tawang Festival is a MUST visit! What is the Purushwadi Firefly Festival? Purushwadi firefly festival is one such event which could give you goosebumps and make you freeze as you get a chance to witness more than 2000 species of firefly come together and glow in the dark. It’s a festival where these fireflies enlighten an entire village with their glow making it look like a Lalaland which is hard to believe with your open eyes. As the night in the village gets darker and darker, Purushwadi comes alive with the magical glowing lights. Sit back and relax as the evening sky unfolds its colors and the millions of fireflies come alive creating magic amidst the silence of nature. The fireflies are alive for only 2 months, May and June. They hatch from their eggs, attract a mate, lay eggs and then die. So the best time to visit is in the first 2 weeks of June. Feel free to walk around the lanes through the village and witness the magic as thousands of lights surround you and leave you wondering on the geniuses creativity of the creator. Suggested Read - Have you heard of the Velas Turtle Festival? Check this out!! About 200km away from Mumbai is a beautiful tribal village which is home to the Hindu Mahadeo Koli tribe and is surrounded by lush greenery and hills called Purushwadi situated in the western ghats. An area which is hardly populated and where electricity and mobile network and still unknown or unheard of. But just before monsoons hit Maharashtra this village not only turns hosts to thousands of fireflies of different species but they also organize one of the most amazing festivals called the Purushwadi Fireflies Festival. The villagers of Purushwadi are rice cultivators and herdsmen and are believed to be protected by the local goddess Zakubai. The best time to visit this village is during the months of May-June soon after a few light showers have taken place and the heavy showers are yet to hit Maharashtra. Suggested Read - A hidden camp site in Sahyadris, known only to a few!! When does the festival commence? The date of the festival tends to vary from year to year, however, it commences during the summer months. During your visit to the festival, you can choose to stay at the canvas tents in the village or even try and stay with the locals and earn an insight into the village life. Enjoy some finger licking local food, rice sowing, plucking of mangoes from the trees or even a swim in the nearby river are some of the activities you can look forward to at Purushwadi. Usually, a detailed itinerary is planned for anyone who visits the festival and you will just not realize how time flew while your stay there. God’s creation is unbelievable and one of his creations are the tiny fireflies who live for only 2 months in a year. During their span of life, they hatch from an egg, become big and becomes like the tiny bulbs, attracts a mate and lays the egg again and then die. 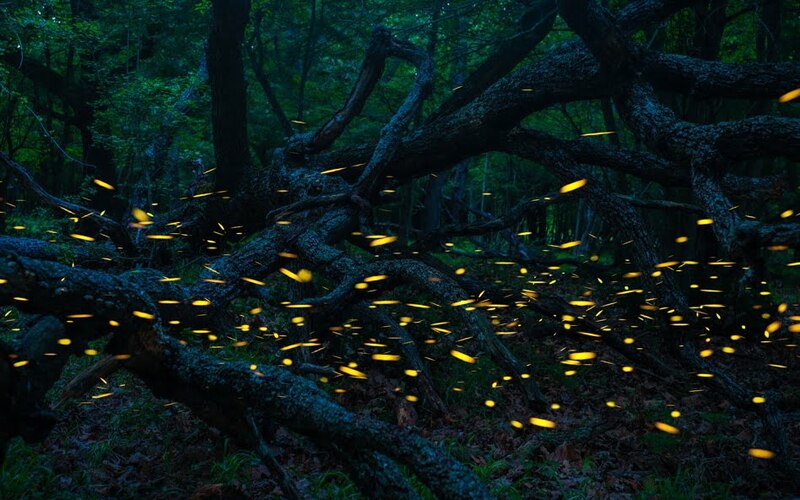 In fact, the male fireflies blink their bums to attract the female firefly for mating. Do remember that by flashing a torch on a tree full of fireflies, you may make them go mad as they must think a big firefly has arrived to steal their ladies. Suggested Read - A stunning yoga retreat perched atop the Tahmini Ghats! By Road – Purushwadi is located about 190 km from Mumbai, near Bhandardara. From Pune, it’s 165 km. By Rail – The most convenient railway station should be Nashik, located about 100 km away. From there, you can hire a cab to Purushwadi. By Air – The closest airports are Mumbai, Pune, and Nashik. You can book a cab from these places to reach Purushwadi. Suggested Read - In December, Nagaland opens its doors!! This is the hornbill festival. Stay options are very limited and there are just a couple of homestays available at Purushwadi. We recommend you stay at Bhandardara and travel to Purushwadi for the sighting. You can also plan your trip with Grassroutes, who are into Rural tourism.